Here is the 2nd of 2 interviews between Steve Ray and Al Kresta on the amazing Catholic country of Poland. 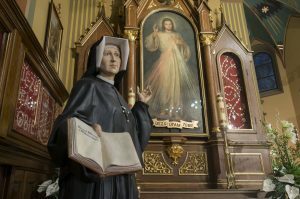 She has the richest heritage of modern saints in the 20th century including St. John Paul II, St. Maria Faustina and the Divine Mercy and St. Maximillian Kolbe. And don’t forget Edith Stein who died in the Auschwitz Concentration Camp. Learn more HERE. We have an interactive map of the sites we will visit, a full itinerary and you can even watch the 90 minute video of our past pilgrimage to Poland HERE.